Wednesday afternoon we arrived at the Men’s Spring Knitting Retreat, running until Sunday. Danny and I attended the first gathering of this kind in May 2008. It was one of the most memorable social events of my life. We are looking forward to another weekend of remarkable community, creativity and relaxation. The Men’s Spring Knitting Retreats have so far all taken place at Easton Mountain Retreat Center. Situated by a mountain lake not far from Albany, New York, it provides a peaceful place close to nature for like-minded men to meet and share their passion for fibre. The retreat includes field trips, workshops and good food. We can use the pool or sauna, sign up for massage, go for a hike or (my favourite pastime) simply sit on the balcony overlooking the water all day. The best part of it all is good fellowship. Since 2008 the events have taken off and spread. The Men’s Rocky Mountain Knitting Retreat takes place in Colorado in July. The Men’s Fall Knitting Retreat happens in Washington State at the end of August. The Midwest Men’s Knitting Retreat takes place in Michigan in November. The organizers intentionally limit registration to provide an intimate group size. About 41 men will attend this weekend. Although the event officially began Thursday afternoon, a number of participants arrived early on Wednesday. 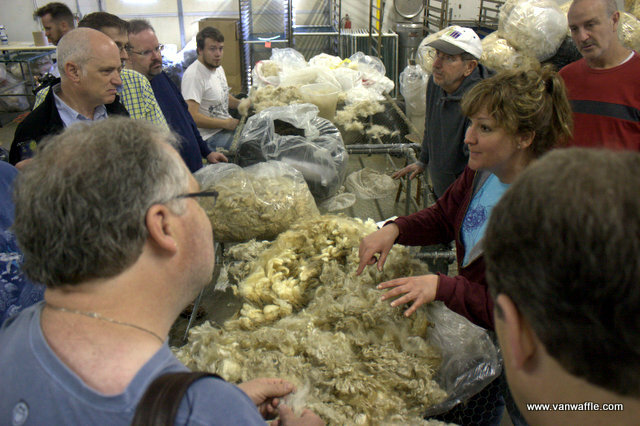 This allowed us to make an unofficial field trip to Batenkill Fibers Carding and Spinning Mill (photo above), which produces custom yarn from wool, alpaca and other fibres. Just now a number of men are scattered around the large meeting hall chatting, knitting, crocheting, ball-winding and spinning. I have registered to take Friday’s introductory spinning course. About 10 wheels are lined up along one wall. The sense of community at these events is life-altering. Although Danny and I attended only once in 2008, we have maintained some friendships since then. Many of the same people have returned this year. It feels like coming home. For me, the peace and closeness of natural beauty enhance the experience. A strong connection with the Earth and with society are two essential aspects of wellbeing. For me, in this place, they come together and synergize.